Turning Point: Fall of Liberty could've been great. Its promising premise supposes that without Winston Churchill around to rally the Allied forces, the Nazis quickly rolled over Europe before setting their sites on the shores of America. You find yourself in the middle of a German invasion on New York City and now the United States and your will to defend it are the only things left standing between Hitler and the universal popularity of the toothbrush mustache. Unfortunately, Turning Point wastes all its potential by offering you too little of everything and winds up feeling like the ultimate so-so shooter. Right from the start, Turning Point fails to make you care about the main character. His name is Carson. He's a construction worker. And that's pretty much all you'll ever know about the mysterious man behind the rifle barrel floating on your screen. What's his story? Why is the US army giving a construction worker the most important missions of the resistance? Turning Point offers no explanation other than the fact that he's the main character. It's not the first game to feature a personality-less potato for a protagonist, but with so little character development, the game feels impersonal and fails to keep you feel motivated to move on. The single player campaign only lasts about five or six hours and during that short time, you'll do all kinds of things that sound great – like defending a ragtag barricade against legions of troops and tanks and assassinating the traitorous US president who turned out to be a lapdog for the Nazis. But Turning Point's linear levels and finicky controls kill the potential for what could've been some really memorable moments and make playing the game a bore. Early screenshots showing the Whitehouse draped in Nazi flags and the invasion of New York City had us hoping that Turning Point's alternate take on history would give us a good reason to pick up a gun and kill some bad guys. But when the time came, Turning Point offered nothing but more of what you've already seen. It’s hard to appreciate the fact that you’re launching an assault on the Whitehouse or that German tanks are rolling through the streets of New York City when the majority of your time is spent trudging through claustrophobic corridors and cramped alleyways as you press through the game’s linear levels. 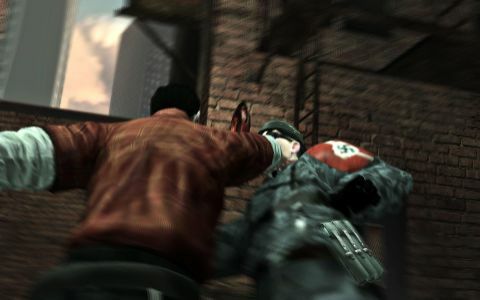 Description This first-person shooter flips the script on US involvement in WWII... can you free America from Nazi control?